A City of David security guard on Monday was lightly injured in his leg when gunshots were fired at a jeep in which he was travelling near Beit Yehonatan in the east Jerusalem village of Silwan. The security guard, who suffered shrapnel wounds, was transferred to Shaari Tzedek Medical Center in Jerusalem for medical treatment. The police suspect the incident was a planned terror attack. According to a police investigation, the jeep sustained six bullets and the shooter apparently fled the scene on foot. backup units were called to patrol the area in search for the suspect. Paramedic Erez Gati from Jerusalem's Magen David Adom told Ynet, "Around 2 am we received a call about a shooting incident. The security guard's leg had scuffmarks, probably from the bullet; he was lightly injured and transferred to Shaari Tzedek Medical Center. The vehicle sustained bullet holes." Gati noted that tensions have been rising in recent days. "The police officers that arrived at the scene were stressed; I assume it's due to the recent escalation in the area. "The security guards said they heard some bangs on the car while driving. At first they suspected it was stones, but then the injured guard felt a pain in his leg. Other than cleaning the wound, there was no need for special treatment," he said. Four police officers were injured Sunday from stones hurled at them in east Jerusalem by dozens of young Palestinians near the Temple Mount. Later on Sunday, riots spread to other areas in east Jerusalem; 18 protesters were injured and at least seven were arrested. The clashes erupted following the cabinet's decision last week to include the Cave of the Patriarchs and Rachel's Tomb in a list of nation heritage sites and Jewish organizations' intention to arrive at the Temple Mount this week in order to "place the foundation for the Holy Temple". Beit Yehonatan is a seven floor structure built without a permit in 2004 and currently inhabits Jewish settlers affiliated with the Ateret Kohanim fund. Despite many appeals, various courts ruled that the structure must be evacuated and sealed in accordance with the evacuation order issued. Last month Jerusalem Mayor Nir Barkat stated that he would act to execute the seal order issued against the structure – but said he will also execute the seal orders issued against hundreds of illegal Arab structures in the area. 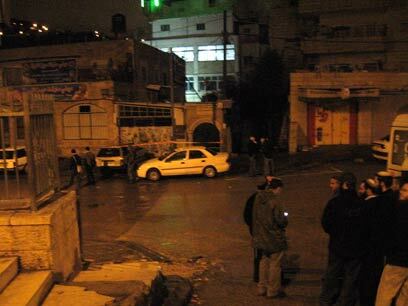 See all talkbacks "Security guard lightly injured from shrapnel in Silwan"